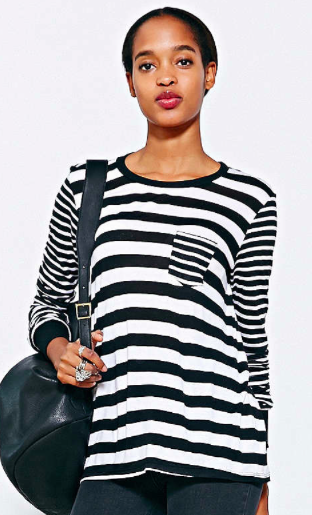 Let's have some fun with stripes today. Have you tried a mixed stripe pattern? It's a style that mixes two or more types of stripe such as color, thickness, or direction. It's a pattern that has a lot of movement and is perfect for any time of year. You've gotta love JCrew. This sweater isn't navy and beige, it's navy and champagne. So make sure to pop a bottle when wearing this cozy sweater. 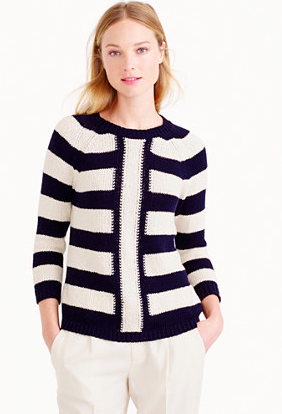 So often when you think stripes, you think nautical but that isn't the case here. 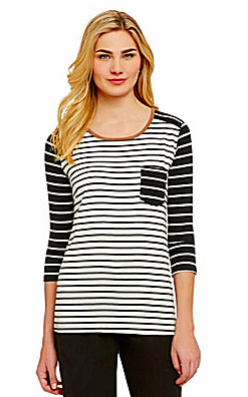 A great 3/4 length tee for layering. A simple dress that commands the room in a always comfy ponte. Even UO is getting in on the game and in a perfectly monochrome way. Such a simple concept. Mixed stripes. Who would have thought?